While our average winter here in Kuwait can hardly be called cold by normal standards, when you're used to summer temperatures in the late 40's and early 50's, we're freezing our mitts off the minute the temperature drops below 15. We even had temperatures hitting as low as 2-4 degrees a fortnight ago! I absolutely love the cold weather and enjoy the 3-4 weeks of winter that we have every year. My skin though doesn't love it as much and turns quite dry and uncomfortable. I've also recently taken up swimming and hours of soaking in heavily chlorinated water is not doing my already dry skin any favours. 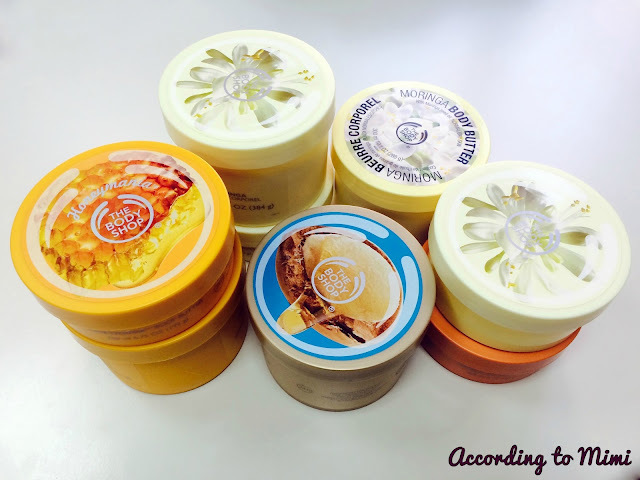 The body butters from The Body Shop are like a godsend and I have a, ahem, small collection going on and I have them everywhere! The bathrooms, bedroom, my office desk, etc. Yes, I know, from the looks of it, I seem to have a big hoarding problem. Hi, my name is Mimi and I am addicted to body butters from The Body Shop. 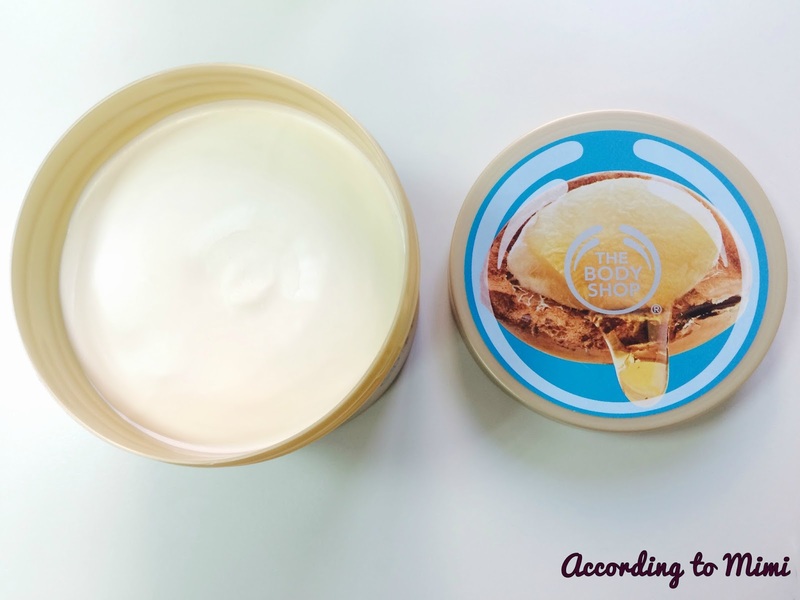 They're just so thick and creamy, its no wonder they're always on The Body Shop's best seller lists. Come winter time, I can more often than not be spotted on the sofa slathering myself with its velvety, buttery goodness. 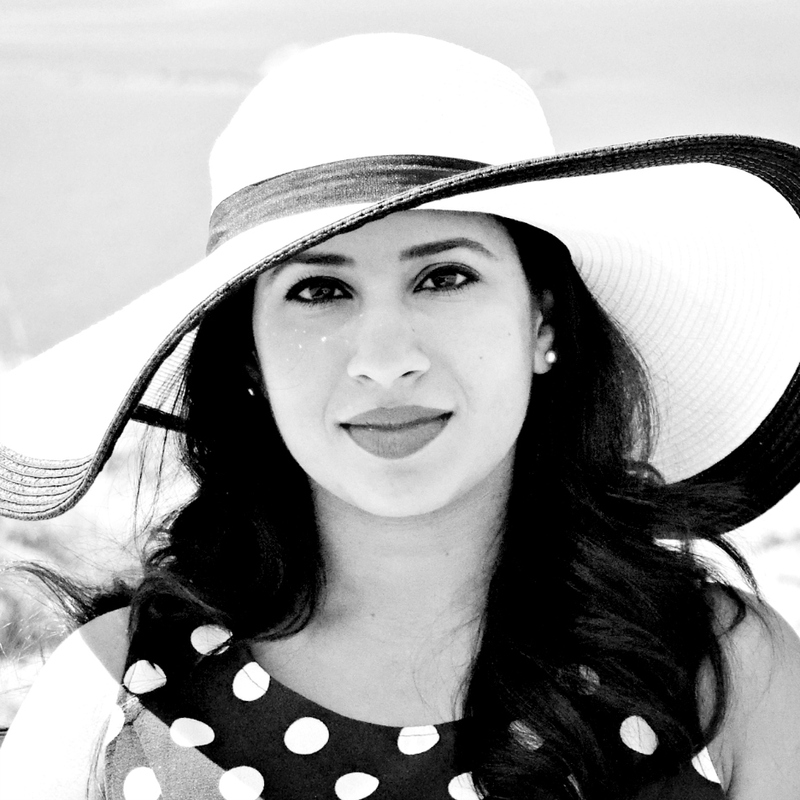 They absorb rather quickly and leave my skin feeling soft, supple, nourished and hydrated. The Body Shop supports Community Trade and their products contain natural ingredients sourced from all over the world. They're also against animal testing, though I probably wouldn't stop buying from a certain company just because they did test on animals, just saying. Controversially though, they do use parabens in some of their products, but on having a quick look at the ingredient list on the back of the butters, I can't find parabens listed anywhere. My favourite body butter by far is the moringa followed closely by the argan oil and the honey. There are a huge variety of different scents, however I personally feel that the satsuma and strawberry scents miss the mark and smell a little artificial. The body butters retail for 7.5 KD for the 200ml which is a little steep, but during the semi-annual sales, the store brings out the jumbo 400ml ones which are amazing value for money. Have a try the next time you walk past The Body Shop. You'll be addicted in no time.